Anushka at Size Zero audio launch in dual color netted saree with floral embroidery designs over the pleats and the borders, paired with plain black quarter sleeved blouse. Rakul Preet Singh at her promotional events of Bruce Lee in a lovely floral saree gown by Varun Bahl. Lakshmi Manchu at the audio release function of Lacchimdeviki O Lekkundi in a black net floral embroidered Pallavi Jaikishan saree paired with gold embellished blouse. 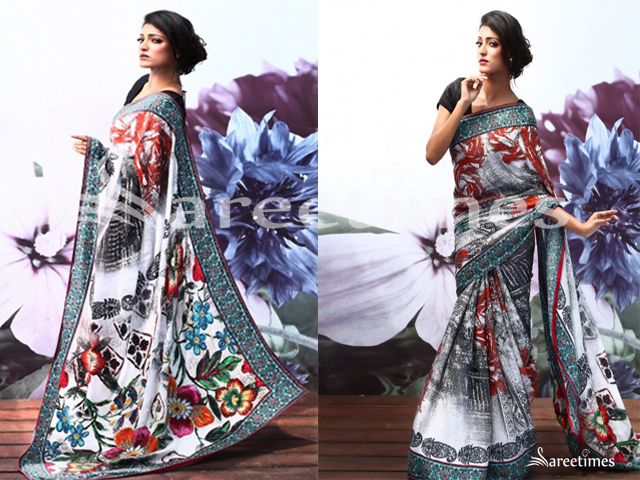 Printed floral sari adorned with multi-colour crystal body& floral print beaded boarder line. Laksyah is an online clothing store started by actress Kavya Madhavan. 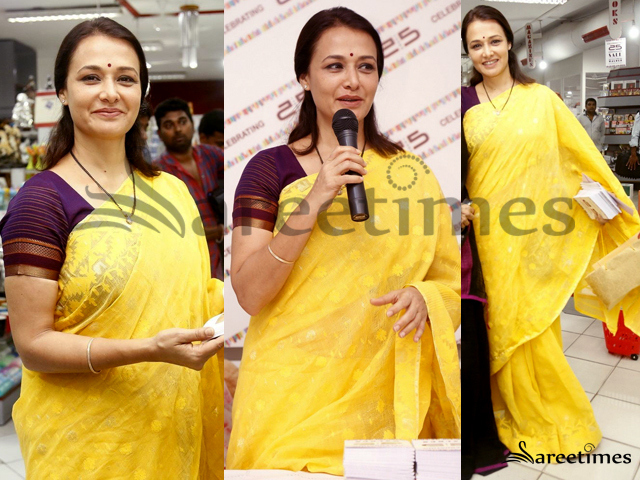 Amala Akkineni at a recent event in a yellow handloom cotton saree paired with contrast purple blouse. 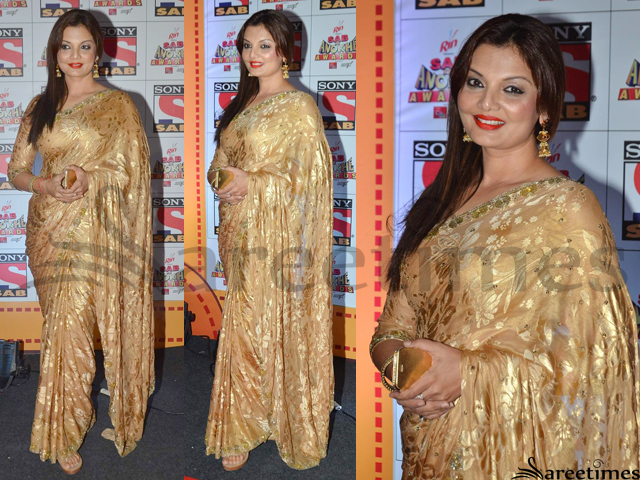 Deepshikha Nagpal attended the Sabse Anokhe Awards event in a beige and golden saree with floral design, paired with an elbow length blouse. Actress Sanjana in Neeru's yellow and peach dual shaded floral applique work lehenga and matching 3/4th sleeves blouse paired with a peach chiffon pallu. 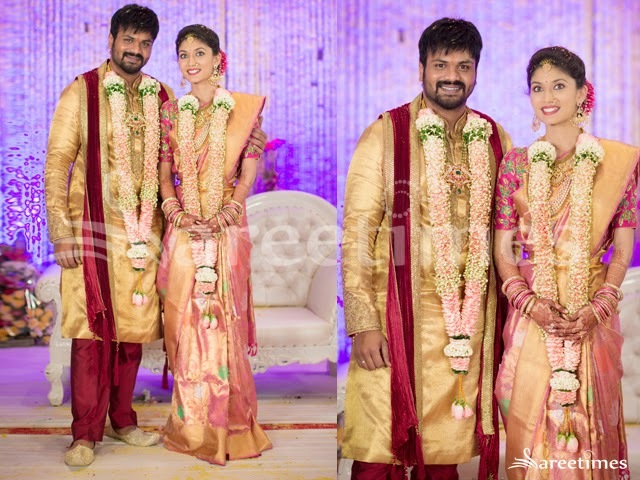 Pranathi Reddy at her engagement in a pink and gold combination kanjeevaram silk saree featuring floral design and gold border paired with pink elbow length sleeves embroidered blouse. Fashion models displaying Archana Nallam's 'Adyatana' collection sarees at Blender's pride Fashion week. 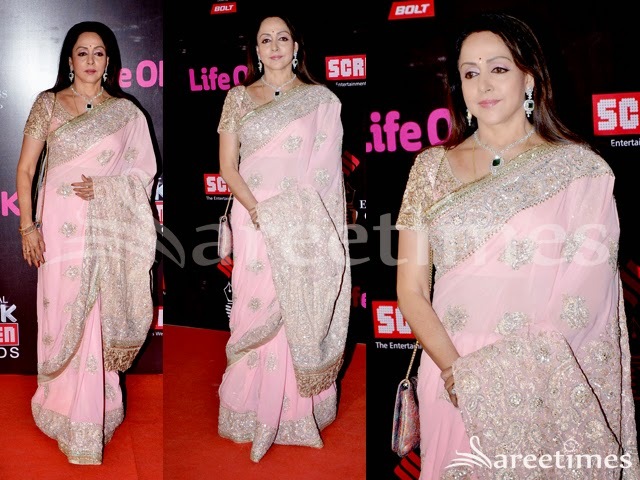 Actress Hema Malini at 21st Life Ok Screen Awards wearing a pink designer saree. Embroided borders with floral imprints all over pallu. Payal Rajput in Multi Colour saree. Payal Rajput at a promotion of a TV serial event in a multi colour saree. Floral embroidery border with floral designs over the pleats. Paired with a short sleeve embroidery blouse. Actress Suhasini at 12th Chennai International Film Festival Inauguration event in half white colored traditional silk saree, with floral imprints and golden zari over the saree. paired with red netted v neck embroidery full sleeve blouse . Actress Kareena Kapoor in a bright yellow saree chiffon saree. Floral imprints over the saree paired with a sleeveless yellow V necked blouse. Actress Sonam Kapoor at Bvlgari India’s launch wearing a white saree dressed in Anamika Khanna. White net saree with white floral imprints on pallu and border. Paired with white laced, half sleeve, V necked blouse. 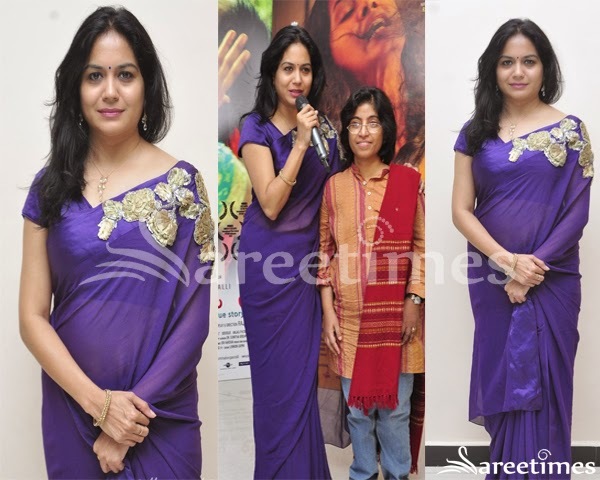 Singer Sunitha at the premiere show of "Naa Bangaru Thalli" wearing a purple plain chiffon saree featuring satin border and gold floral applique work over the shoulder. Paired with a short sleeved, v necked purple blouse. South Indian actress Kushi in beautiful whtie and yellow designer net saree. 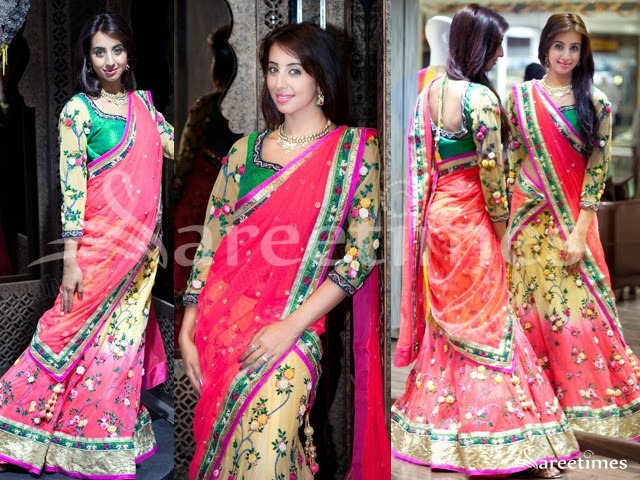 Embellished flowers and small patch work all over saree. Gold embellished patch work through out yellow and green,pink plain borders. Paired with designer cap sleeves saree blouse for back. South Indian actress Kushboo in beautiful yellow designer horizontal stripe saree with cream border at Vijaya Awards 2014. Embellished applique patch work designs through out border. Paired with designer short sleeves saree blouse for back. Embellished floral designs highlighted. 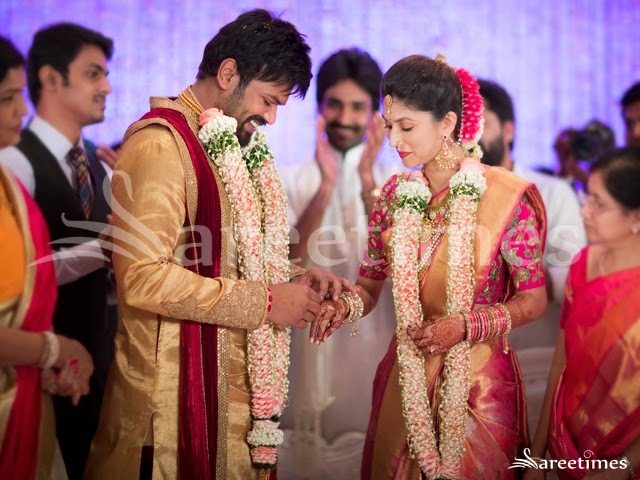 South Indian actress in beautiful red designer embellished saree with gold patch work border. Gold embellished floral designs all over red saree. Paired with designer halter neck saree blouse for back.